ensuring the safety of the traveling public across the country. You might not realize it, but chances are every time you get in a car you drive across one or more bridges. Per the federally enacted National Bridge Inspection Standards (NBIS) every bridge, big and small, old and new, needs to be inspected on a biennial basis. As you can imagine, this is a huge undertaking for each state’s department of transportation (DOT), and each DOT is looking to inspect bridges faster, more cost effectively, and in less disruptive ways as to not impact the day to day usage of the bridge. A dynamic, rapidly growing bridge inspection method is to “climb” the structure using rope access techniques. Rope access can best be pictured as a mixture of rock climbing and bridge inspection. The inspector is suspended from two ropes and can either ascend, descend or climb along the bridge. Certain bridges can often have elements that are inaccessible or uneconomical to inspect with traditional methods, such as rigging or the use of under bridge inspection vehicles. Rope access can be tailored for countless geometric challenges, which allows for a detailed, hands-on inspection of every bridge element. In other words, rope access allows inspectors to go anywhere and see any part of the bridge. 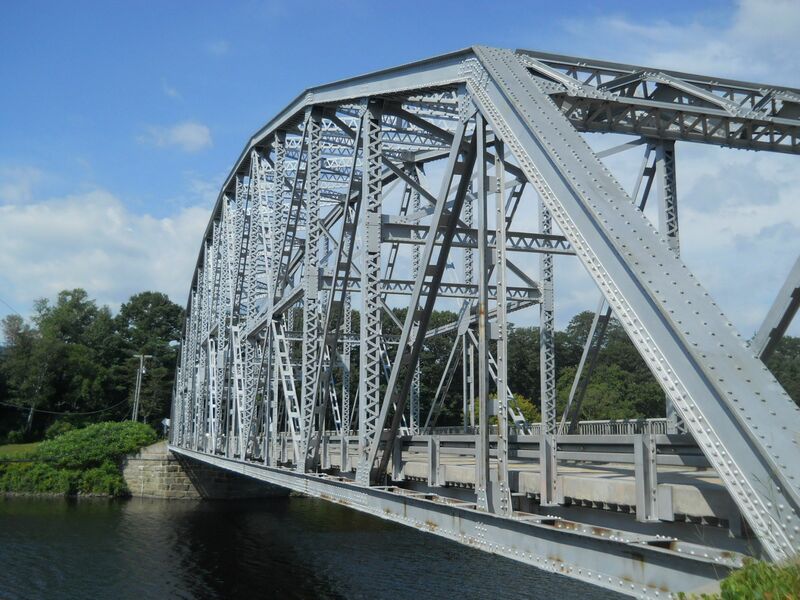 Recently a team of five Hoyle, Tanner bridge inspectors including three SPRAT1 and/or IRATA2 rope access inspectors completed a bi-annual inspection of the Memorial Bridge in Augusta, Maine. This 2,100 foot long, 75 foot high historic deck truss bridge posed many challenges for bridge inspection access. Access from the ground below was limited because part of the bridge is over the Kennebec River, and access from above was prevented by a tall chain link fencing that runs the entire length of the bridge. Most importantly, this bridge is a vital transportation route in the heart of the state capital making closing all or part of the bridge to traffic undesirable. Utilizing rope access techniques, we were able to perform a hands-on inspection of every member of the bridge from below the deck and above the river. Rope access allowed for a faster and more cost effective inspection than the traditional methods typically used. Society of Professional Rope Access Technicians– North American body for developing rope access standards and practices. Industrial Rope Access Trade Association– Internationally recognized body for developing rope access standards and practices. Materials & Design:Engineers use the building code formulas to determine the appropriate snow load for their new design. A detailed study, prepared in 2002, set the ground snow loads throughout New Hampshire and is the basis for all new construction projects. Structural engineers use various design standards for steel, wood and concrete that include factors of safety and account for serviceability issues such as deflection. Older structures, governed by earlier building codes, may not meet current standards. Detailing and Construction:The type and condition of the bracing and roofing materials can contribute to (or undermine) its strength. Some older steel framed buildings used a cantilever beam layout to minimize the beam sizes by using the load of one beam to reduce the stress in the adjacent beam. Because snow buildup occurs in an unbalanced manner, roof failures have been attributed to this type of construction. Minor renovations to an existing structure can reduce the carrying capacity when, for example, bracing is removed to add new ducts. A recent study, published in STRUCTURE magazine, found that the bulk of New England roof failures were related to construction or detailing deficiencies and were not a result of excess snow loads. Pitch & Thermal Conditions:The slope and type of roof surface determines how much snow is retained on the roof. Flat and low-pitch roofs are more commonly prone to overloading because they hold onto snow more easily than steeper ones. Flat roofs without adequate drainage are at increased risk of failure due to ponding that occurs as a result of excessive deflection. Adding insulation to the structure reduces the heat loss causing less melting, and results in larger loads. Similarly, the absence of any heat will increase the snow retained even more. Roof Layout Geometry:The location of hips, valleys, high roofs and low roofs, and raised elements – like skylights and dormers – create snowdrifts and therefore factor into determining additional loading. Similarly, the addition of snow guards on a sloped roof change the dynamics of the snow behavior on the roof. 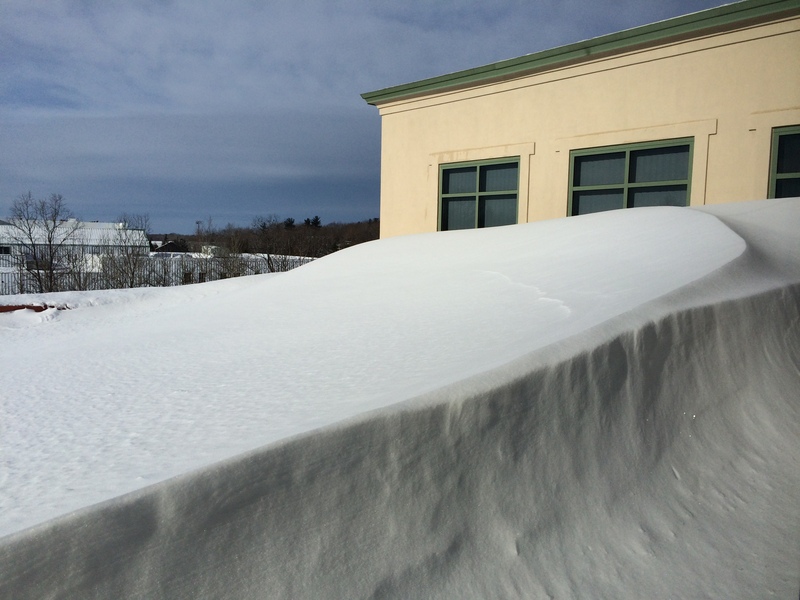 Parapets and large roof top equipment can cause snow drifts on flat roofs. The addition of a new structure adjacent to existing structures often create drift conditions that are not accounted for adequately during renovation projects. Depth and Snow Density:Determining the weight of snow based on depth is not possible unless you know the density of the snow on a particular roof. The density is the weight of the water in a set volume of snow. Snow on a roof will compact over time as temperatures fluctuate and as new snow layers are added to the roof. Rain-on-snow increases the density of the snow thus increasing the weight. Measuring this density is not terribly scientific and is not as important as how the roof is actually performing. Sun and Wind Exposure:Natural elements such as sun and wind impact how much snowfall is retained on a roof. From a code perspective, 70% of a single snowfall event is expected to remain on a roof under normal wind conditions. Wind and sun can create unbalanced snow load conditions on a gable roof when more snow is retained on one side of the ridge than the other. Maintenance:Proper, or improper, maintenance plays a role in how well a building will perform under load. Some older roofs suffer from steel beam and connector corrosion, or rotting wood, which reduces the building’s ability to withstand heavy snow loads. Proper maintenance, including repairs to any damage or leaks, is important to ensure the structural integrity of the entire structure. For more information, please contact our Building Structural Department .